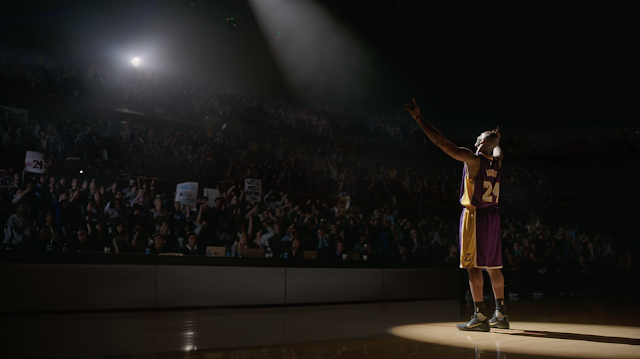 20-year pro basketball career of Kobe Bryant was concluded last night in Los Angeles, Bryant playfully orchestrates a symphony of cheers and jeers in Nike’s new film, “The Conductor,” which illustrates the athlete’s polarizing effect among players, coaches and fans, whom many have loved and others have loved to hate. Cameos in the new film, directed by Mark Romanek and developed in partnership with Wieden+Kennedy Portland, include Hall-of-Fame coach Phil Jackson, 10-time All-Star and Los Angeles native Paul Pierce, former world champion Rasheed Wallace, a flustered Benny the Bull and passionate fans representing nine basketball teams. “The Conductor” continues the love-hate theme surrounding Bryant,established by Nike Basketball last Thursday and leading into Mamba Day today. This tribute illustrates how hate has manifested into respect and admiration for Bryant. It began with Nike athletes across multiple sports wearing black and gold shoes as a symbolic tribute to Bryant’s golden career fading to black. The Conductor completes his final symphony. Available for a limited time beginning at tipoff of the Black Mamba’s final game tonight, the KOBE 11 Mamba Day iD celebrates Bryant’s career by the numbers. Fans can also give their final word to Bryant through the Mamba Day Generator, which overlays the user’s selected farewell phrase on a photo that can then be shared on social media. Lastly, the full KOBE 11 Black Mamba Pack is available on eBay, with each of the 13 shoes autographed by Bryant. Auction proceeds benefit The Kobe and Vanessa Bryant Family Foundation.